Master of laws (LL.M.) in estate planning, University of Miami School of Law. Daniel D. Simjanovski has had an of-counsel relationship with Femminineo Attorneys since 2004. His primary areas of focus include probate administration, estate planning, trust administration, tax planning, and business planning. 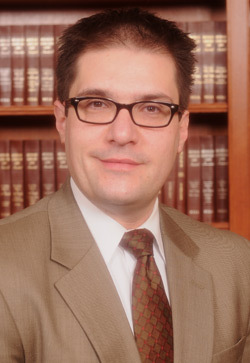 An active member of the State Bar of Michigan – particularly the probate and estate section and the elder law section – Mr. Simjanovski also holds annual certifications of completion through the state bar’s Probate and Estate Planning Program and the Institute of Continuing Legal Education. He is a member of the Macomb County Bar Association, the Macomb County Probate Bar Association, and the Wayne County Probate Bar Association, and has been admitted to practice in Michigan state courts, the United States District Court for the Eastern District of Michigan, and the United States Court of Appeals for the Sixth District. Mr. Simjanovski has a bachelor’s degree in accounting and a master of finance from Walsh College. He earned his J.D. from Wayne State University Law School and a master of laws (LL.M.) in estate planning from the University of Miami School of Law. He is fluent in Macedonian, Serbian, and Bosnian languages. A resident of Macomb County for 32 years, Mr. Simjanovski has been a business owner in the county since 1991 and proudly serves as president of the St. Mary’s Macedonian Orthodox Church. Certified as a civil mediator pursuant to the requirements of the Michigan State Court Administrative Office, he is also a volunteer mediator for the Resolution Center of Macomb County.